The Puerto Rican Heritage Poster Series is the result of collective efforts undertaken since the 1970s to rescue, document and preserve the long history of Puerto Rican migration and the experiences and contributions of Puerto Ricans to U.S. society. 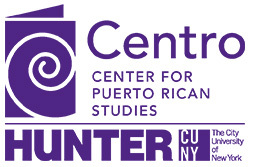 The Center for Puerto Rican Studies (Centro) at Hunter College, CUNY has been a leading contributor to these efforts. This poster series relies on and incorporates many decades of historical recovery work by Puerto Rican studies researchers at Centro and many other higher education institutions and by the dedicated team of professionals at the Centro Library and Archives. A total of eight posters were designed for this series to provide an attractive visual educational tool for teachers and others to use in the classroom or any suitable public spaces, and to introduce students to and interest them in the historical information highlighted in the poster captions and accompanying images. Five of the posters constitute the Brief Historical Chronology of Puerto Ricans in the United States and the remaining three are demographic and historical maps that reflect different aspects of the Puerto Rican migration experience in the United States. Where do Puerto Ricans Live? This poster series was designed with a study guide that makes it easy to include this series into classroom lessons. The Centro Puerto Rican Heritage Poster Series documents the history of Puerto Rican migration and the experiences and contributions of Puerto Ricans to U.S. society. Demographic and historical maps that reflect different aspects of the Puerto Rican migration experience in the United States. The Puerto Rican Heritage Poster Series is the result of collective efforts undertaken since the 1970s to rescue, document and preserve the long history of Puerto Rican migration and the experiences and contributions of Puerto Ricans to U.S. society. This is a poster series designed to provide an attractive visual educational tool for teachers and others to use in the classroom or any suitable public spaces, and to introduce students to and interest them in the historical information highlighted in the poster captions and accompanying images.